Aerosolv® is the safe and economical way to dispose of aerosol cans. Safe, convenient and compliant, Aerosolv® provides an easy-to-use, effective method of relieving pressure in spent aerosol cans. It changes them from solid hazardous waste to a non-hazardous, fully recyclable state. This eliminates the expense of solid waste disposal of aerosol cans. Every 100 cans punctured and emptied by Aerosolv® increases recyclable scrap metal by 25 lb. and reduces solid waste by 10 cubic feet, making Aerosolv® extremely cost effective. As an added benefit, residual liquids may be eligible for reclamation or recycling, resulting in "waste minimization credits. The contents of over 4,000 spent aerosols may be collected in just one 55-gallon drum. 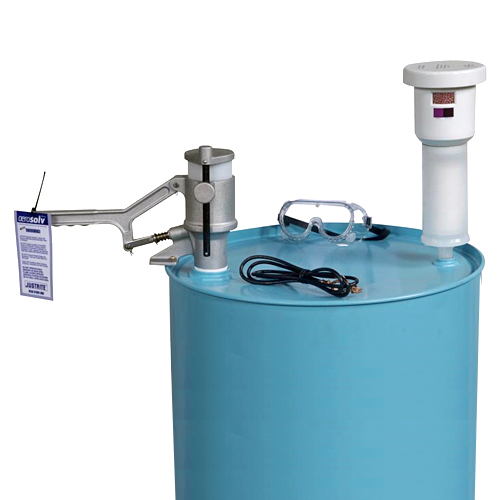 The puncturing unit, which depressurizes empty aerosol cans is made of low maintenance aircraft aluminum and threads into the 2" bung of a standard 55-gallon drum. All moving parts are 308 stainless steel. It accepts series 200, 300 and 6 oz. cans. No power source is needed. Simply insert inverted can, tighten sliding plate to engage, and press handle to pierce a smooth edged hole into the dome of the can. Carbide-tipped piercing pin withstands repeated use with no visible signs of wear after puncturing 10,000 aerosol cans. The combination coalescing/carbon filter threads into the .75" drum bung and is comprised of two parts. The lower coalescing portion removes airborne liquids while the replaceable, upper activated carbon portion adsorbs hydrocarbons and odor.